Temperatures are lowering, don’t be lulled into lowering your vigilance! Do not let the temperature outside fool you. Cold water immersion and hypothermia can occur in water as cool as 70 degrees at any time of the year. Even on a warm and sunny day a sudden and unexpected fall into cold water for as little as 30 minutes can result in hypothermia – and if you’re not wearing a life jacket can even lead to a lifethreatening situation in as little as three to five minutes. Wearing life jackets saves lives – Wear yours! 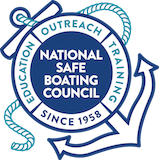 Most, if not all, boating-safety education professionals agree that the one single thing that would contribute the most to reducing deaths and saving lives would be wearing life jackets. Statistics show time and time again that many boating fatalities could have been avoided if the victim had only been wearing a life jacket. Wearing a life jacket while boating is like wearing a seat belt when driving or riding in a car. Wear one anytime you are on a boat or even near the water or on a boat dock. And, with the new inflatable life jacket technology in the marketplace, a variety of life jackets are available for those over the age of 16 that are not bulky, hot or uncomfortable. Don’t forget that for those boaters who are 13 years of age or younger, the law requires them to wear a life jacket (properly sized, fitted and worn to the manufacturer’s specifications) any time they’re on a boat that is underway (not at anchor, made fast to the shore or aground) on Federal waterways — even when launching or retrieving your boat. Laws vary from state to state, so always make sure you’re in compliance by just wearing it! Without a life jacket, most people die LONG BEFORE they become hypothermic. If you suddenly find yourself in the water, stay calm and move slowly. Don’t try to take off clothing in the water (a common misconception is that heavy clothing or waders weigh down your body when in fact these articles (if not filled with water) can trap air and help keep your body afloat). • Gasping, hyperventilation and panic. • If not wearing a life jacket, a higher risk of drowning. • Cooling of arms and legs impairs sensation and function regardless of swimming ability. • Gradual cooling of the body’s core temperature eventually results in loss of useful consciousness. Wearing your life jacket could be the single most important factor in surviving cold water immersion! If your boat has capsized, stay with it. More than likely it will not sink and it can be used as a platform to maneuver, so stay on top of it as much as possible, getting yourself out of the water and maintaining stability. Falling overboard is often due to slipping, loss of balance when standing, moving around the boat, or reaching for objects in the water. Focus on slowing heat loss. Emergency signaling devices (i.e. emergency locator beacon, whistle, mirror, small flares). All life jackets provide life-saving supplemental floatation in the water, but no one style is perfectly suited for all persons in all situations. Read the life jacket label. Make sure it is U.S. Coast Guard approved, the proper size for the intended user, and appropriate for the activity. See the life jacket selector on the Coast Guard’s Boating Safety Internet page, or Alaska’s www.PledgeToLive.org for more information. For more information regarding cold water immersion and hypothermia, check out Beyond Cold Water Bootcamp’s “4 Phases of Cold Water Immersion” for some of the latest information dealing with this potentially deadly recreational boating issue.